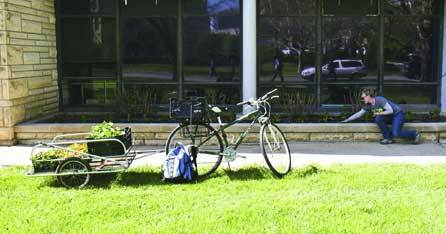 You are here: Home / News / Bike News / K-State Groundskeepers Ride Bikes! Found this in the news today….sounds like a dream job. After adding large baskets and crates to their small fleet of bikes, crew members found that they were able to transport themselves and most of their gear easily and quickly. The workers also enjoyed riding from site to site and reaping the health benefits. Sounds like a great job…I ride to work and then sit behind a computer (actually 2 computers) all day. Have fun this summer!